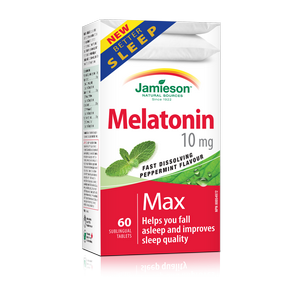 Jamieson Melatonin 10 mg Fast Dissolving Tablets are formulated to help restore optimal sleep patterns and correct disturbances associated with air travel (“jet lag”). The formula’s fast dissolving technology lets your body quickly absorb the active ingredients for fast action and maximum effectiveness. Non-medicinal ingredients: Mannitol, cellulose, calcium silicate, sodium sulfate, crospovidone, natural flavours (debittering, peppermint), vegetable magnesium stearate, silica, sucralose, peppermint oil, menthol. Consult a health care practitioner prior to use if you are taking: anticoagulant, anticonvulsant, blood pressure, immunosuppressive, sedative, hypnotic or psychotropic medications, or steroids; if you have: cardiovascular, chronic kidney, immune system or liver disease, depression and/or related diseases, asthma, diabetes or hypoglycemia, hormonal or seizure disorders, or migraines. Consult a health care practitioner if symptoms persist or worsen or sleeplessness persists continuously for more than 1 month (chronic insomnia). Do not use this product if you are pregnant or breast-feeding. Mild gastrointestinal symptoms (nausea, vomiting, or cramping) and/or rare allergic reactions have been known to occur; if this occurs, discontinue use. Adults: Take 1 tablet at or before bedtime. Do not drive or use machinery for 5 hours after taking melatonin. Consult a health care practitioner for use beyond 1 month. For jet lag: For occasional short-term use, take once a day at bedtime after darkness has fallen while travelling, and at destination, until adapted to the new daily pattern.